I was out with just Stellan and Ellie yesterday. I pulled up to my first stop and both of them were sleeping. Uh… Now what?! I’d forgotten such possibilities. It turns out, I can still carry two sleeping babies and a diaper bag, lock a vehicle, and hold both until the older one decides to wake up and walk. Back when Ruby was born, Sterling wasn’t walking yet – and didn’t for 4 more months. Carrying two babies was the norm then. I’m rather glad I don’t have to anymore. There’s always several sets of capable arms to help carry babies! I decided to go get a copy of Stellan’s birth certificate since I was driving past that office. I got both babies out, headed to the door… It was locked. President’s day. Now I’m getting tired, and we still have to run to one more store. I climbed in the back of my giant van to buckle babies back into car seats, realized Stellan needed a clean diaper, changed him, then went to hop out – and opened the van door into a car backing into the spot next to me. The guy didn’t even check his car that I’m pretty sure I didn’t dent. He just blew it off and headed to wherever he was going. Whew. Stellan’s a crank. I kept thinking I never get awake photos of him. It finally dawned on me. Unless he’s sleeping, he’s nursing or screaming. Neither lend themselves to a photogenic moment. He sleeps great at night. But daytime has him hollering, eating, or sleeping. I’ve had a moment or two lately thinking that I’m too old for this. I got that one last night. Between, no joke, screaming fits. On the bright side, he nurses every 30-60 minutes unless he’s sleeping. Those cheeks are filling out nicely. 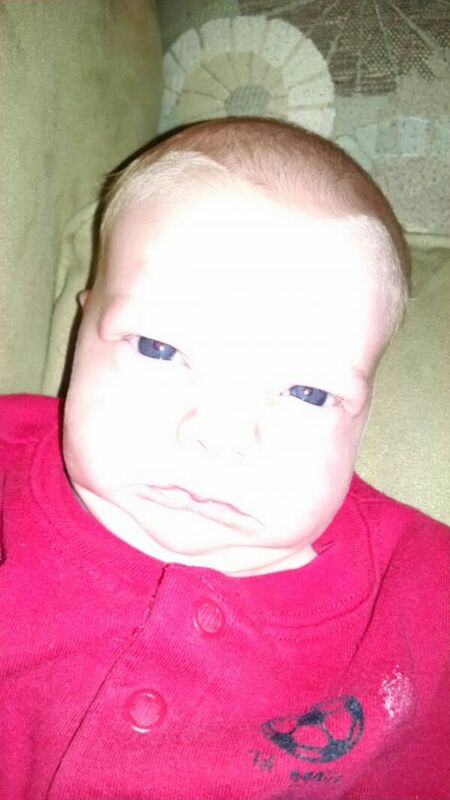 My phone totally blew this one out, but it highlights his perpetual frown quite nicely. It also displays his chins quite well. Life is getting back to normal. We’re back at school, meals are made, laundry is back to a constant battle after mom left. The kids love to hold Stellan and several are getting quite good at the bounce/rock/pace Stellan requires. It’s a good thing, because it’s the only way I can accomplish anything. He loves the ring sling when we’re out, but every time I try it at home he loses all composure. Seasoned momma or not, every baby is different enough to make me question if I know what I’m doing at all. Beyond school and two-littles errands yesterday, I made Elliot an owl for her birthday in a couple weeks. She’s crazy about owls and, well, now she can have a crazy looking one-side-is-pointier-than-the-other owl. Life is just a little crazy like that right about now. Miss doing the laundry for you, and miss you and the kiddos, but not the shopping trips – Ha. I know all about having to bounce that little guy. Funny how they decide what works for them and they know how to get it. They seem to be able to make life all about them at a very early age. Doesn’t seem to get much better as they grow either. : – ( He’s still cute as a button though. 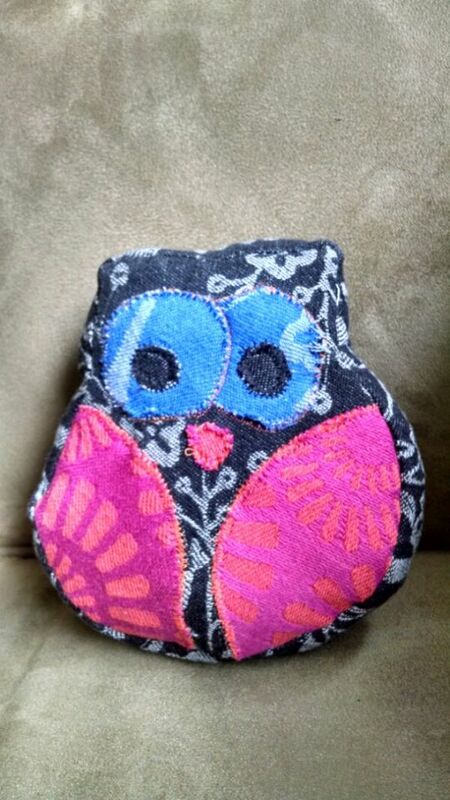 Love Ellie’s owl – looks like a lot of your sling projects. Very pretty. I would never be able to carry 2 sleeping kiddos. WOW!! I can’t imagine how you can do it either. Those extra hands have to be a lot of help for sure. Hope he gets less fussy soon. 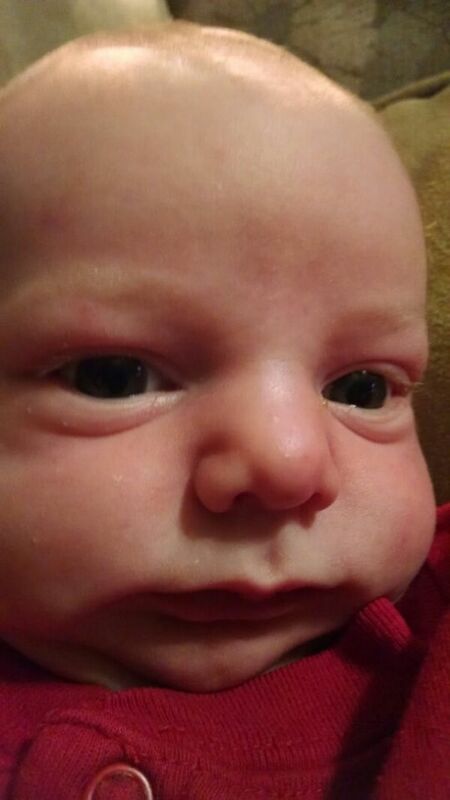 My 6th baby only slept in 20 minute increments. I’m not exaggerating. The rest of the time he was screaming or eating. 20 minutes increments of sleep. Every. Single. Night. Or day. Possibly longer, but I wouldn’t know, because at that point I kicked him out of our room into a pack n’ play that was located ANYWHERE BUT NEAR ME. At that point I told God that I was REALLY, REALLY, REALLY too old and tired to do this EVER AGAIN. He didn’t agree. He slipped one more in there before I had a chance to argue. Ps: You are so right. Two or three littles is WAY harder than having all seven of my kids around. I agree! How ever do you carry two? Sounds like you’re doing quite well getting everything back to “normal” so quickly, and even managing to sew Ellie an owl! Hope little Stellan turns into a happy guy soon. My first was sort of like that and they have gotten easier every time since then. I’m probably in for a dozy next time! You amaze me. It’s 2:30 and we are just starting school. Being pg with #8 has been hard on me.